My blog readers are probably getting tired of me expressing my love of butternut squash, but I am going to do it again. I love butternut squash and fall cooking in general. As I have stated before the flavors of fall are comforting and delicious when the weather gets cold. Butternut squash to me is one of the staples of fall cooking. It is extremely versatile and can be used in pastas, soups, stews, chili and baked goods. It is also a great way to hide vegetables for kids in muffins and breads. Stew is a staple in my house during the fall and winter. I am always cold once the weather gets cooler so I make a lot of hot stews and soups in order to stay warm. 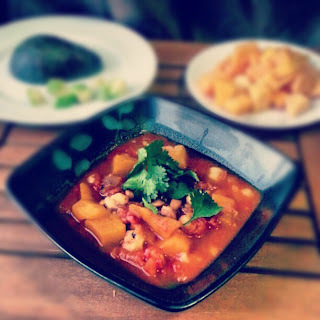 When I first started cooking stews for my family we all fell in love with posole. It is a satisfying and delicious dinner and I make it frequently. Last week I tried a new recipe for Butternut Squash and Tomato Posole from Eating Well magazine, which looked like a great new vegetarian posole recipe. This recipe has 11 ingredients. It takes a total of 45 minutes, 20 minutes of which is active and makes 5 servings. I had no problems finding any of the ingredients at my local grocery store. I normally buy whole butternut squash, but my store was out so I bought already cut butternut squash. The recipe suggests breaking up the tomatoes by hand, I find this messy. The method I always use is to place the tomatoes in a Ziploc bag, squeeze out the air and then crush the tomatoes by hand in the bag. Much less messy and an easy clean-up. I let my posole cook slightly longer than the recipe suggested. At 30 minutes the squash was more firm than I like. Make sure to fully rinse your canned beans. If the beans are under rinsed they will have a metallic taste, which is unappetizing. I followed the remainder of the recipe as written. With 10 grams of fat and 9 grams of protein this is a satisfying meal without being high in fat. The fresh avocado and cilantro on top gives the posole a nice well-rounded flavor. I will say that this recipe isn't overly spicy so if you like spicier posole I would suggest adding a small amount of cayenne. This recipe in addition to being healthy is also inexpensive, costing less than two dollars a serving. For the recipe go to Butternut Squash and Tomato Posole. Mmmmm I LOVE butternut squash! This sounds delish!! Thanks :) I love butternut squash also, it is so versatile! My friend mad a Butternut squash soup and I would love to make some for my husband. I didn't grow up on that vegetable. Do you have a good recipe with milk? I have made it with milk, I just normally don't follow a recipe when I do it. Let me see if I can find anything that would work. Thanks because I have a slight milk allergy and I'm lactose intolerant.